The Columbia Shuswap Regional District (CSRD) and the City of Revelstoke (City), in partnership with the Province of BC, have completed a “Diagnostic Inventory” of the South Revelstoke Study Area. This study collates background information and community perspectives on governance, land use, and service delivery to better understand the implications of City boundary extensions in the South Revelstoke area. The data contained in this inventory will serve as an objective baseline to inform potential future analysis that considers the benefits and costs/detractions of incorporating some or all of this area into the City of Revelstoke from both the City, and Electoral Area B perspectives. The report recommends several action items which may be considered by the CSRD Board at upcoming meetings. 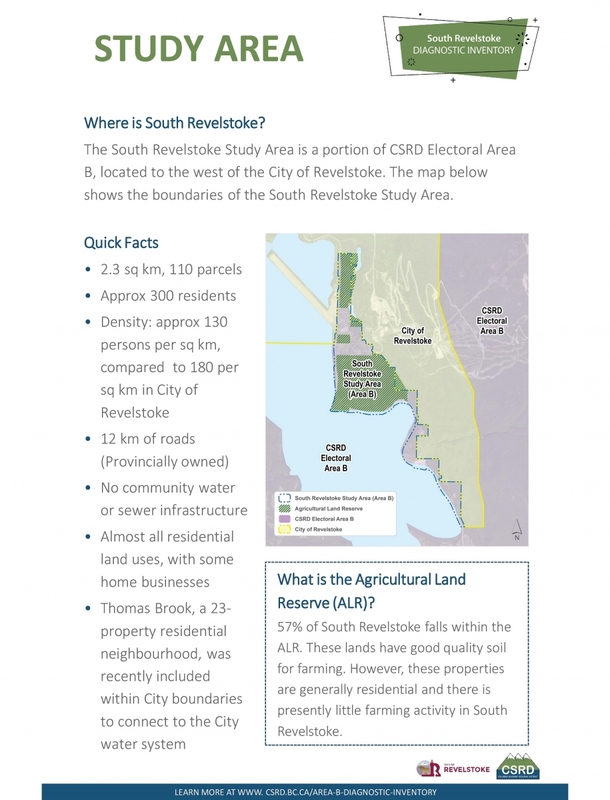 Please review the fact sheets and the South Revelstoke (Electoral Area B) Diagnostic Inventory Final Report for further information.